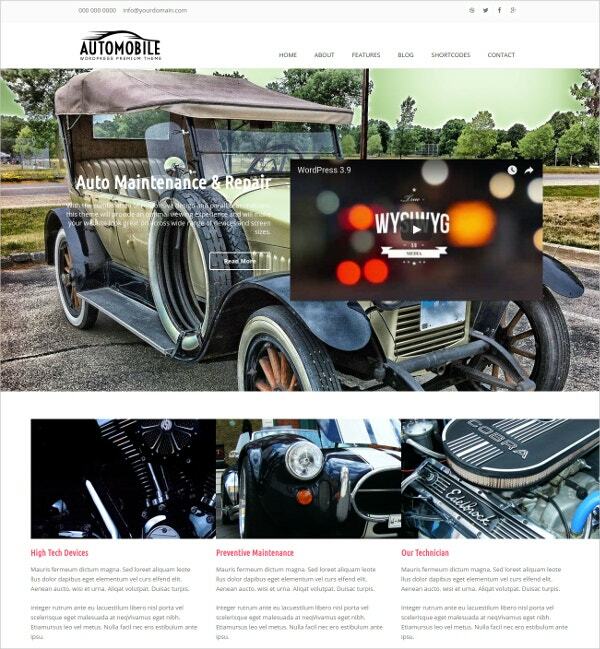 If you are a part of a business working in or with the automobile industry and want to build a website for your business, then automobile website templates are what you need. Websites are extremely important in this modern age for a business to grow. Websites are useful for potential clients to learn about your business as well as to contact you. You can use the site to display the positives of your business and attract potential prospects. Automobile Website Templates are of great help for those who have little to no knowledge of code as they are very easy to use. 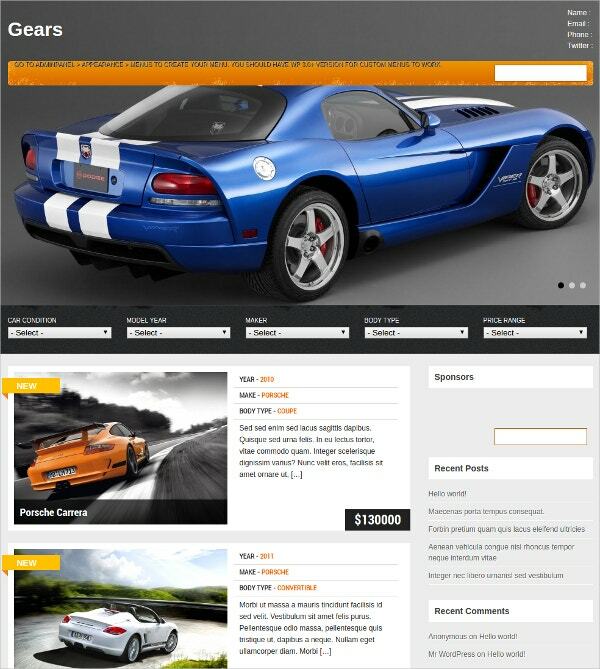 We have selected the best automobile website templates available on the internet. Check them out. 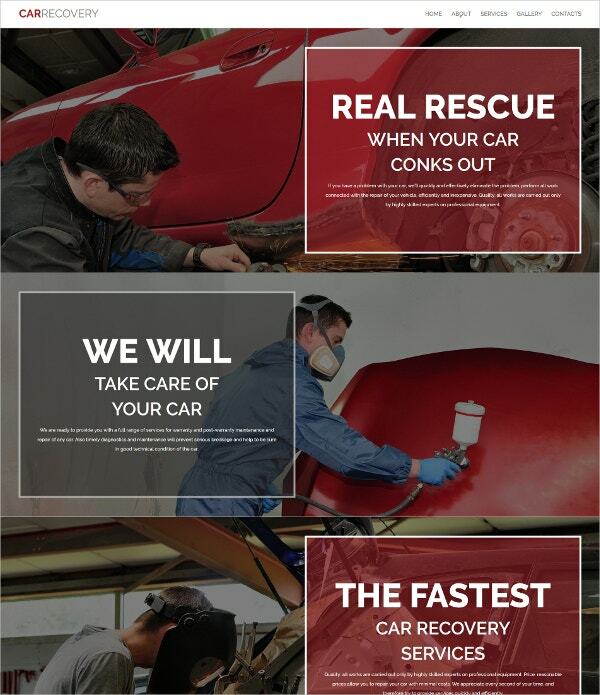 It is a perfectly designed automobile website template if you want to create a website for your car repair workshop. You can avail a 14 day trial of the template to decide whether you want to purchase it. Its responsive design makes it viewable on any browser on any device. Using the drag and drop editor you can with ease create sections listing the various kinds of services you provide. 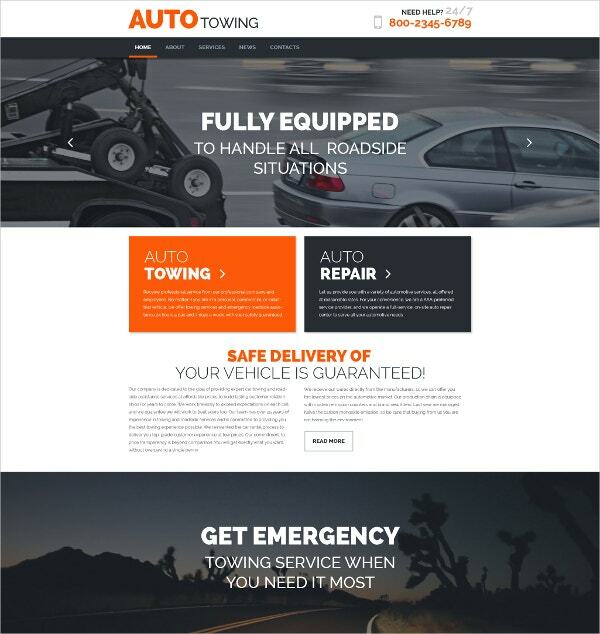 If you have got a towing company then this website theme is what you need to create a website for your company. It is beautifully designed and can be viewed on any browser in any device. A Retina ready template makes sure that your site looks good even on displays having high pixel density. The MegaMenu is useful to list the variety of services you offer in detail for customers to view. 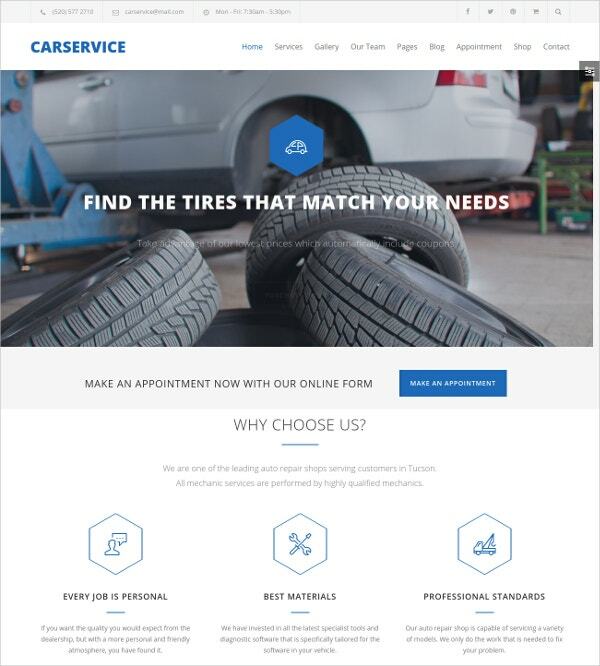 If you have a business that deals in sales of cars as well as their parts and accessories, this template is all you need to create a website for your business. It has a very attractive design which is perfect for car sellers and dealers. You can choose from multiple themes for your homepage. Powerful functions in the template help visitors to easily browse through different parts of your website that meet their search requirements. 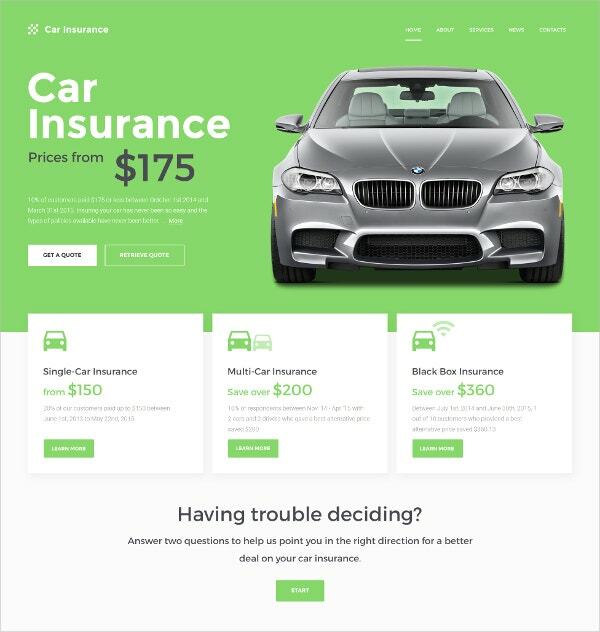 This amazingly designed website template will be a good buy if you plan on creating a website for your can insurance business. Contact forms will be useful for customers to apply as well as ask their queries. You can choose from a variety of Google fonts the one you find the best suited for your site. Available font icons can be resized anyway without loss in resolution. Google maps can be used to add the locations of your business. This website template is best suited for businesses like car repair workshop, mechanical workshop, auto painting and detailing shop. Even rental services or car wash services can use this theme to build a website for their business. An appointment form is available in this template which can be used by customers to make prior appointments for your services. Set of demo pages, posts, sliders and widgets are available if you find it difficult to create unique ones on your own. 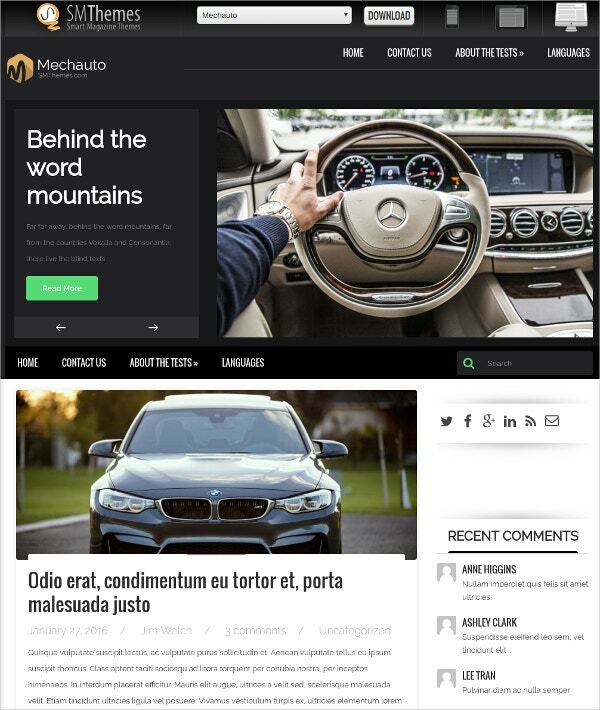 If you want to create a website for writing about cars, information about new models, comparisons, reviews, opinions, etc then this website template will be the perfect choice for you. It is very well designed and easy to customize. 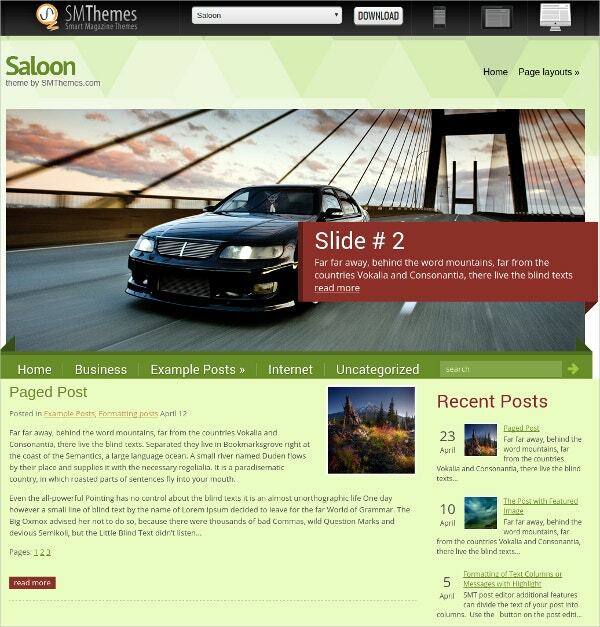 Widgets and social share bar can be used to make the site responsive on various social media platforms. The translation option makes the content readable in multiple languages. You can download the basic version of this theme for free. 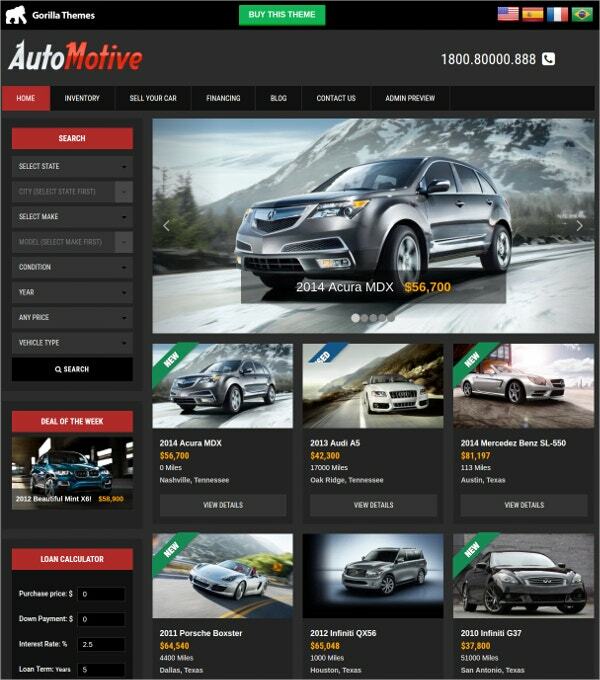 This is a neatly designed website template best suited for automobile dealerships. You can also earn revenue by using your site to show ads and getting paid for them by using “Pay Per Listing” which gets you paid instantly via PayPal for each ad listing. VIN number decoder will be useful for visitors to get information about any vehicle by entering its VIN number. 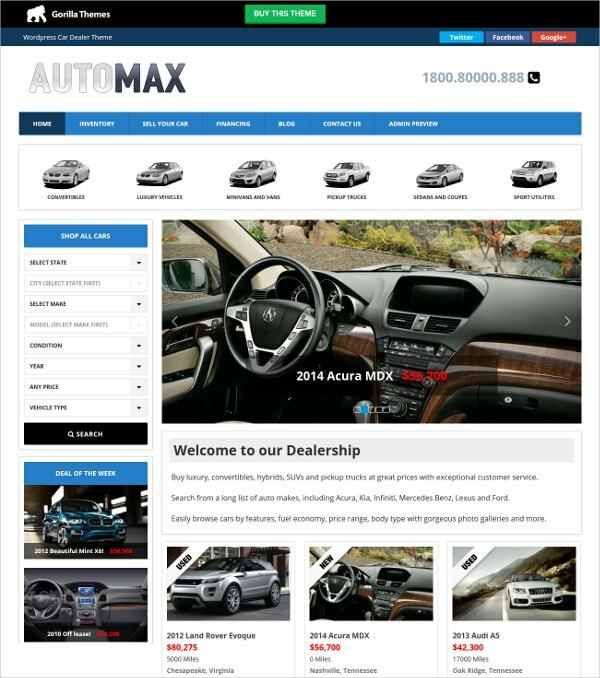 You may also see Car Dealer WordPress Templates. 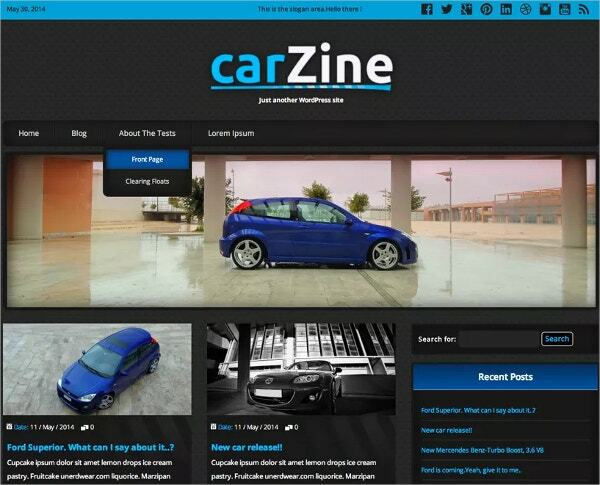 This amazingly designed website template can be used to create any kind of automobile website. The combination of bright colors used in it makes its viewing a soothing experience. You can use it to develop a website without requiring any coding knowledge. It is supported by WooCommerce and thus will benefit your business. The responsive design will be useful to view it on a variety of platforms. This template is free to download. 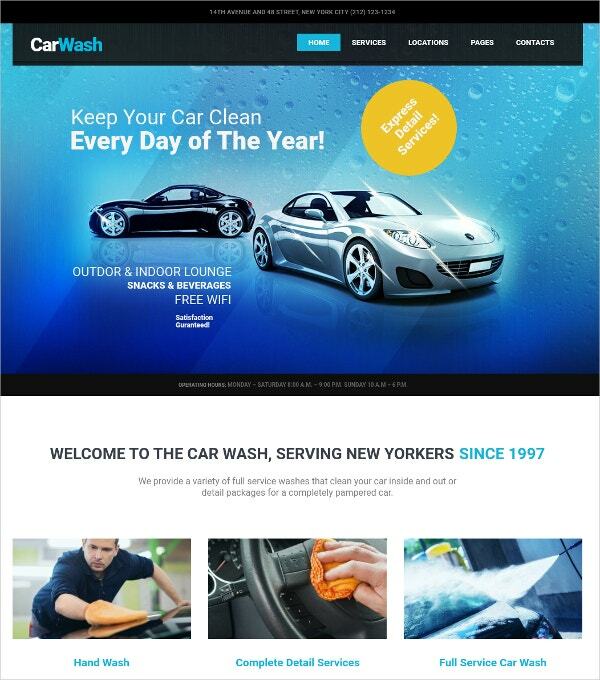 If you wish to make a website dedicated to your car wash or auto service then this website template is what you should choose for doing so. Its attractive design will surely boost your business. You can choose from 3 different homepage layouts. Revolution and swipe slider will make your website touch friendly. You can choose from a variety of demo files and create an exact copy of the preview for your own website. 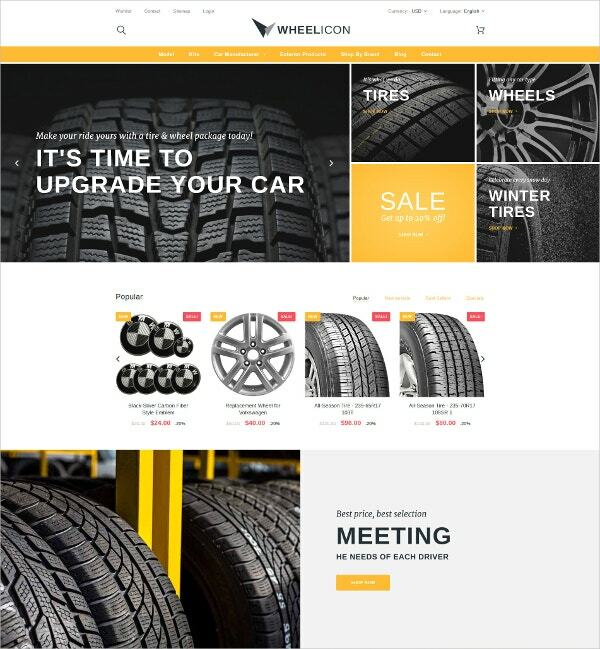 This beautifully designed website template is the perfect choice for you if your business is involved with sales of different types of tires and their parts for vehicles. You can integrate multiple online payment gateways in your site and thus make it easy for customers to make online purchases. TM modules worth $430 are included in this template. Its mega layout module makes the site look very impressive and will greatly benefit your business. 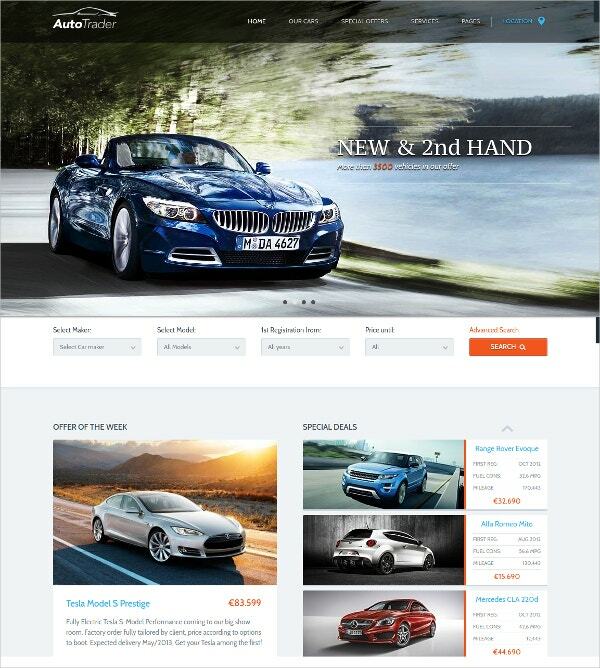 This website template is useful for creating a website for car dealership involved in buying and selling of new and used cars. “Pay per listing” module is useful for getting paid via PayPal for purchases as well as for ad revenues. You have unlimited color choices for your theme which you can easily customize using the WordPress customizer module included in the template. You can also create unlimited automatic scheduled imports with the included Schedule Inventory File Import. 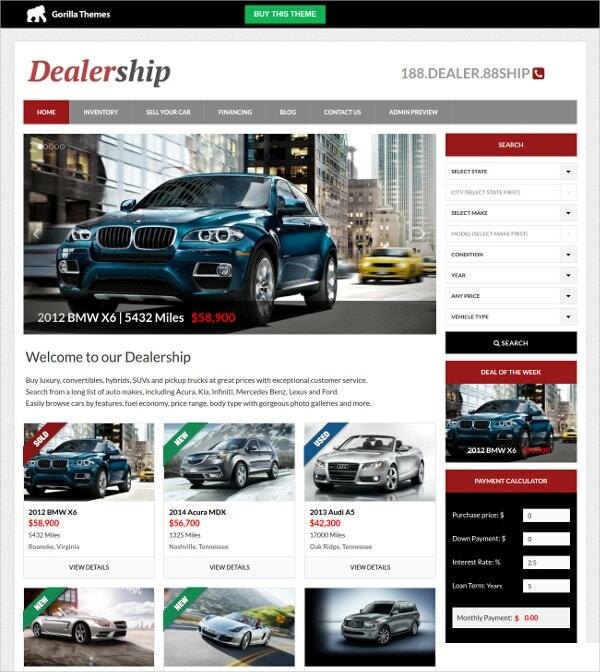 This website template is the perfect choice for your car dealership and will surely give a good boost to your business. The template has a very professional look to it and can be used for other kinds of automobile dealerships as well. Search filters make it easy for visitors to choose a car matching their desired brand, price range, make and type. Car listing page makes it easy for visitors to check out different cards and view the details in the subsequent pages. This is a very nicely designed auto listing theme which you can use for various purposes. You get two types of homepage options- blogs and cars. The blog option enables the viewing of blog entries while the car option enables the viewing of car listings. You can add your contact details on the site for potential prospects to be able to contact you. A video is available where you can see how to customize the template with ease. This is a magnificently designed website template will satisfy the website requirements of a variety of automobile-related businesses. The website can be easily set up using the template without requiring any knowledge of code. A Step by step tutorial is available which will guide you in creating the website. You can insert slideshows which will be an attractive way to show different aspects of your business. Contact forms can be used by customers to contact you for various queries. It is one of the most beautifully designed website templates which will be a perfect choice for car manufacturers. You can use this to create a site showcasing various aspects of your industry, and how you manufacture your cars with videos and images demonstrating how it’s done. Available shortcodes make it easy to design the website without sufficient knowledge of coding. Custom sidebars and sliders make the website touch friendly. This template is free to download. 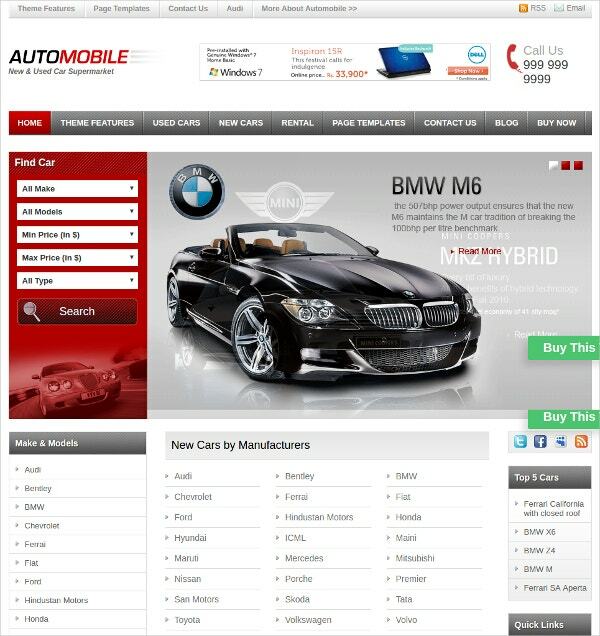 If you own a car dealership and want to create a website dedicated to it then this website template is what you need. It is very neatly designed and has all the features that you would require for your site. You can earn instantly by ad listings as well as sales using the “Pay Per Listing” feature which allows you to get paid via PayPal. You can choose from a variety of color options the one you find the best suited for your website. If you want to build a website for your automobile related business then this website template will be highly beneficial to you. 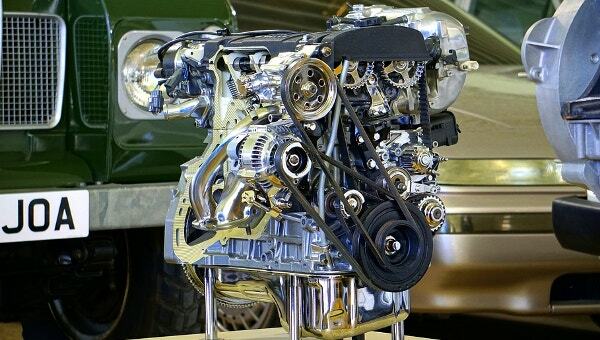 It is best suited for automotive blogs and magazines. This theme is based on Twitter Bootstrap. It is useful for presenting new as well as used cars, motorcycles, motorbikes, trucks, etc. You can easily design and set your own logo on the website. There are various other theme options for you to choose from. This theme can be downloaded for free. 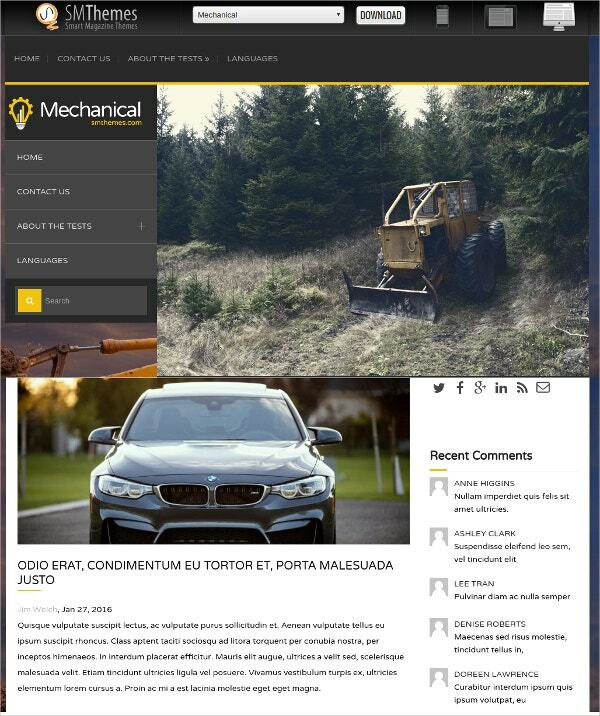 This is a very professionally designed website template which can be used for dealing in high-end vehicles as well as for automobile blogs and magazines. You can choose from multiple homepage themes and color combinations for your website. You can also add animations and videos on the site. The template’s responsive design makes it viewable on mobile and tablet devices as well. Retina ready feature helps in displaying it in high pixel displays. These are the most highly rated automobile website templates available on the internet. All of them are very neatly designed and are sure to do wonders for your business. You do not need to be a professional coder to be able to use them. Download the theme that is best suited for your business and create your own website with minimum effort.